It has been three months since the historic close flyby of Pluto by New Horizons, and new discoveries have been coming in quickly about this previously little-known world. The first paper detailing these results so far, “The Pluto System: Initial Results from its Exploration by New Horizons,” has now been published in Science. New Horizons has revealed Pluto and its moons to be more complex and geologically active than ever thought. The new paper is the cover story in Science for Oct. 16, 2015. New Horizons passed Pluto on July 14, 2015, at a distance of only 12,500 kilometres (7,750 miles), providing the first close-up view of a place which until now had only been a fuzzy point of light in the best images taken from Earth. What were once just blurry hints of surface features are now icy mountains, canyons, and glaciers on this frigid world. Being so small and so far from the Sun, it was surprising to see Pluto now as an active place. Some of the mountains seen are as tall or taller than some mountains on Earth, and the large regions of smoother, glacier-like ices are similar to what is seen in the polar areas on Earth. A key feature seen is the “heart,” also known as Sputnik Planum, a roughly heart-shaped and relatively flat area of ices which seem to slowly flow in much the same way that glaciers do on Earth. On Pluto, however, the ices are composed of nitrogen, methane, and carbon monoxide; similar in appearance but much different in composition. The mountains, however, are massive blocks of water ice, which is as hard as rock in the extreme cold. The bedrock and crust is also rich in water ice. Large areas of Pluto don’t have exposed water ice, but rather a mix of the other ices, which occur naturally in the extreme freezing temperatures of Pluto’s surface. Since Pluto is only one of many smaller bodies in the Kuiper Belt, it is now thought that other relatively large Kuiper Belt objects (similar in size to Pluto), such as Eris, Makemake, and Haumea, may also show evidence of similar geological activity. The flyby showed that there are always surprises waiting to be found; before the encounter, it was theorized that Neptune’s moon Triton would be similar to Pluto, since it is thought to be a former Kuiper Belt object also, before being caught by Neptune’s gravity and becoming a moon. 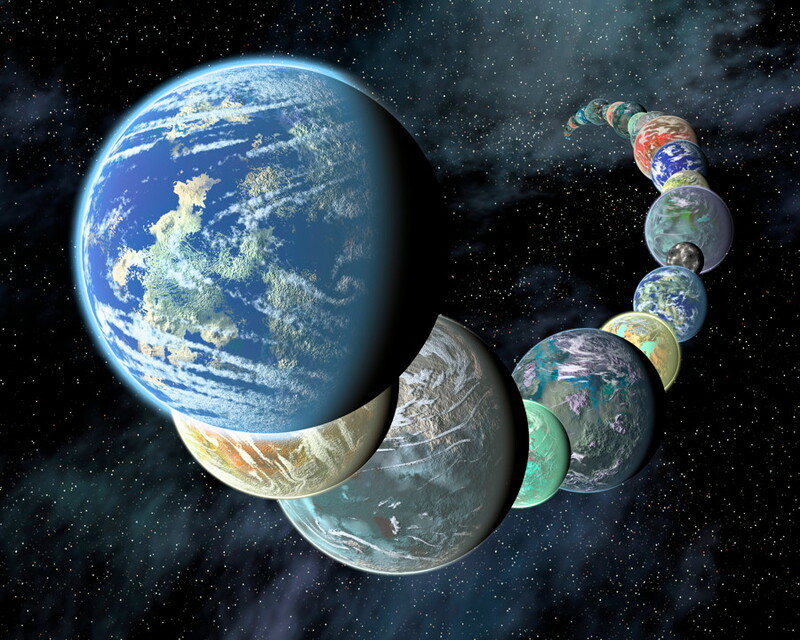 But now, scientists have seen distinct differences between the two worlds. 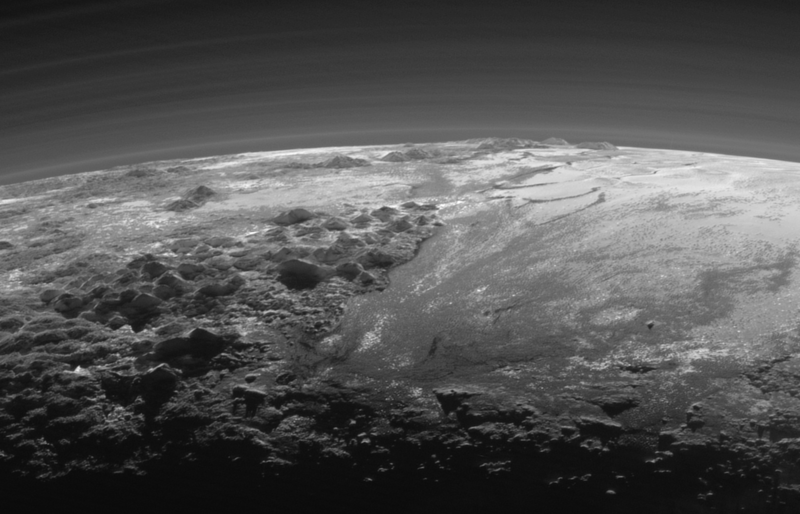 One of the most stunning images sent back was the view of Pluto backlit by the Sun, after closest approach. 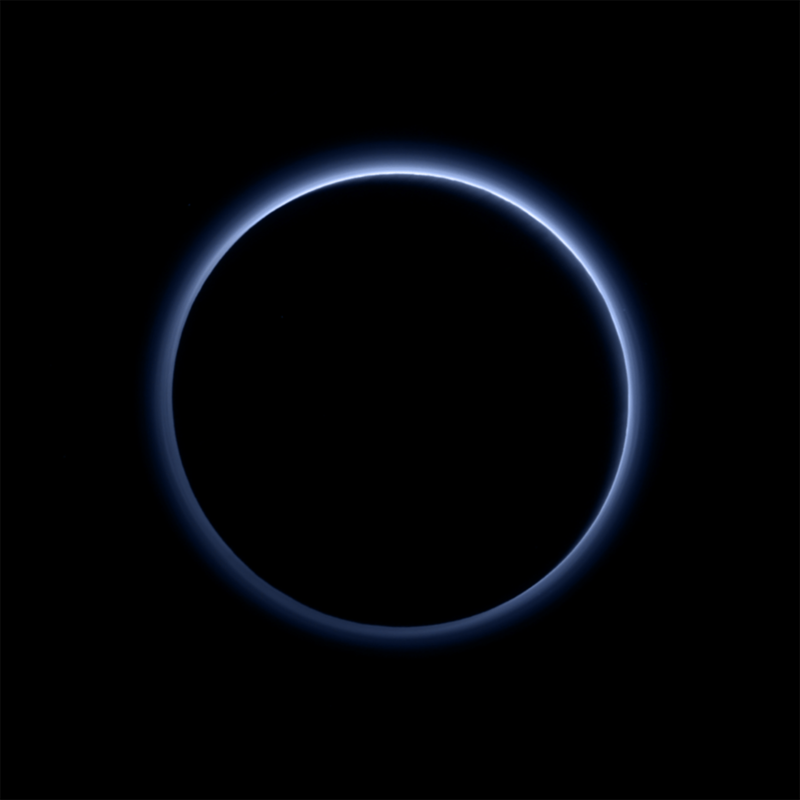 The thin atmosphere of Pluto is seen as a beautiful thin blue ring surrounding the dwarf planet, not too different from similar views of Earth. A larger version of the “blue sky” image can be seen here. 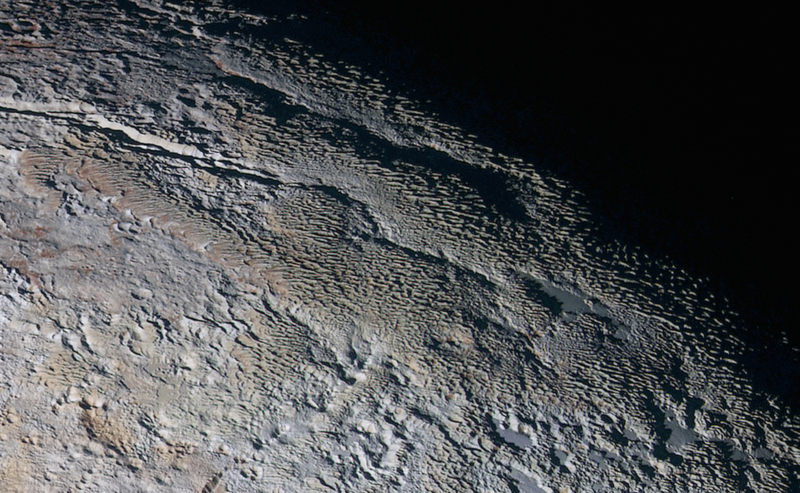 The surface also features a range of subtle colour differences, and New Horizons also founded patches of red water ice. Pluto has turned out to be a very colourful place. In other regions, there is a weird-looking type of terrain called “snakeskin,” a rippled mix of blue-grey ridges and other reddish material. How it formed is still unknown, but it is one more piece of a fascinating puzzle regarding the geological history of Pluto. 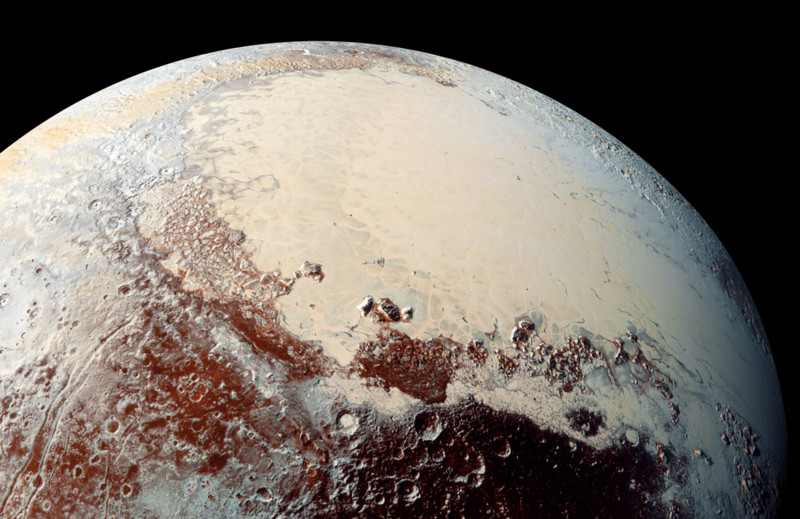 It is also speculated that Pluto may have nitrogen geysers, similar to those seen on Triton, but as of yet none have been spotted. 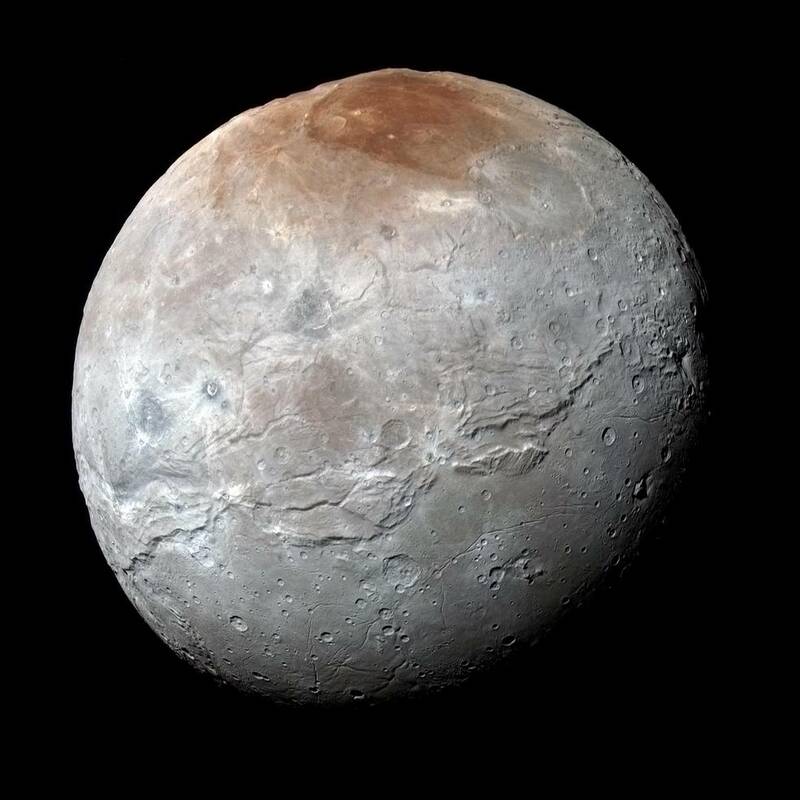 Pluto’s largest moon Charon is also full of surprises, with huge canyons, a “mountain in a moat,” and reddish material covering its north pole. It has also been theorized that this moon may have had a subsurface ocean of water, similar perhaps to Europa and Enceladus. The large cracks and other geological formations found suggest that may have been the case. If so, could that ocean still exist today? What about Pluto itself? As of now, only about 10 percent of the data gathered by New Horizons during the flyby has been returned to Earth. The rest will be sent back for almost another year. The information should help scientists understand some of the mysteries of Pluto, such as how its thin nitrogen atmosphere is replenished and whether it “shares” that atmosphere with Charon, as has been theorized. An intriguing theory is that the nitrogen in the atmosphere comes from cryovolcanism, a sort of cold version of volcanism on Earth, where ice and gasses are released instead of hot lava. The new knowledge about Pluto and its moons should also provide clues about the many other objects in the Kuiper Belt, a region of the Solar System still unexplored until now. What else is waiting to be discovered? The New Horizons spacecraft is currently 5 billion kilometres (3.1 billion miles) from Earth. On Jan. 1, 2019, New Horizons will reach its next target in the Kuiper Belt, the tiny wordlet 2014 MU69.